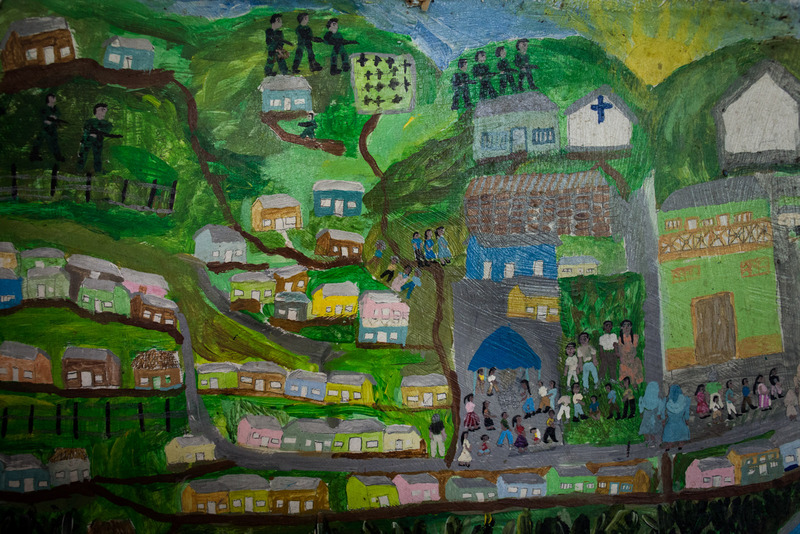 The Peace Community of San José de Apartadó in Colombia was formed on 23 of March 1997. 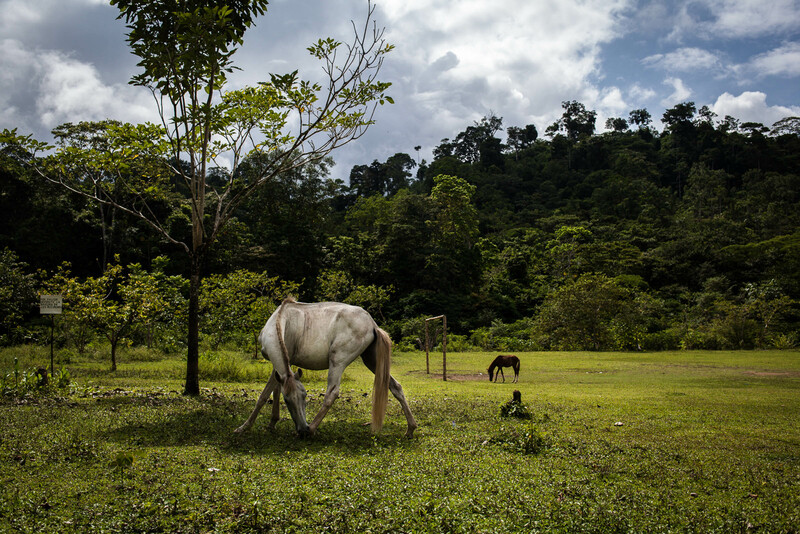 The town of San José and its agricultural hinterlands are located in the mountainous zones in the region of Urabá. 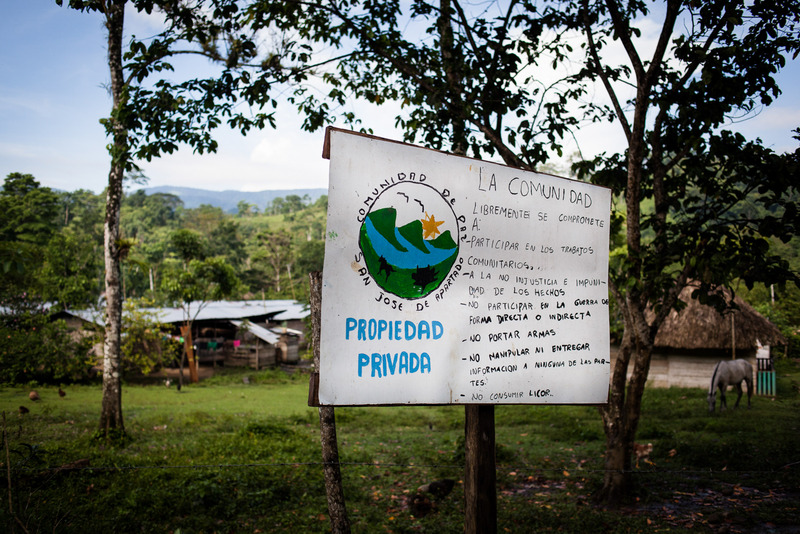 The Community is defined by its strict internal regulations : not to grow coca; a commitment to engage in communal work, not to take any part in the armed conflict, not to pass information to or aid any belligerent groups. 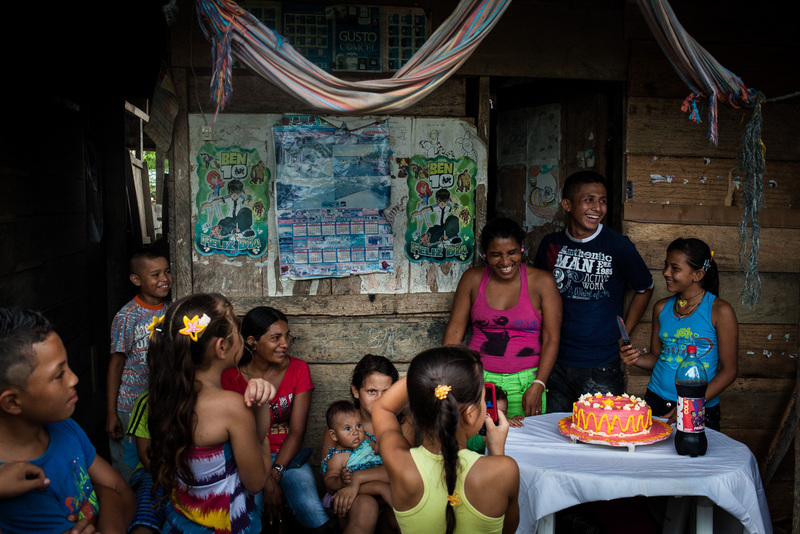 For this very rule, its population is regularly threatened by armed groups. View of San Josecito, main village of the community. 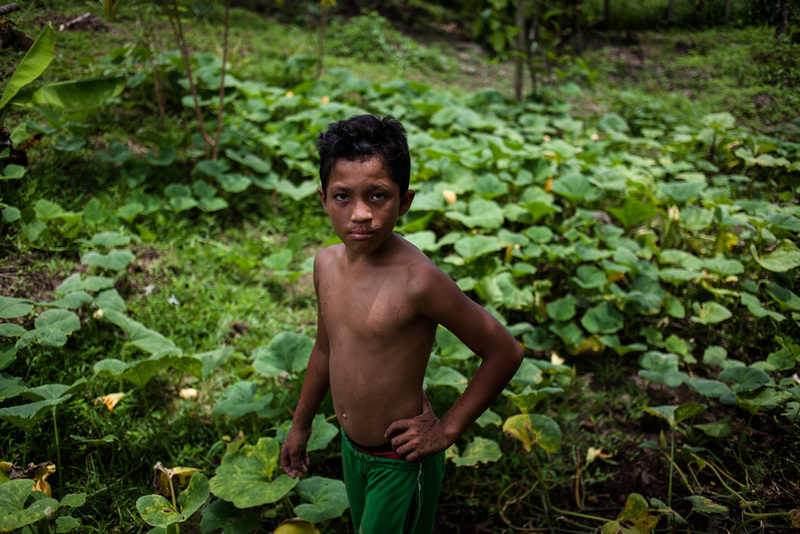 2 to 10 hours of walking are required to reach the other villages belonging to the community. 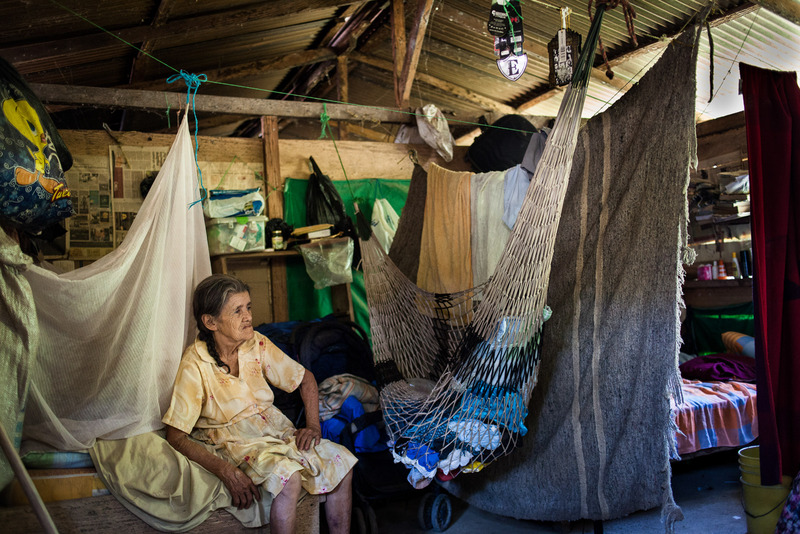 The oldest woman in the community is the mother of its founder, Jesus Emilio. Despite her age, she carries on working for the community. The first sign you see when you walk in the community : the rules. Participate in the collective works, fight against impunity and injustice, do not take part in the armed conflict, do not wear weapons, do not communicate any information to the armed groups, do not drink alcohol. 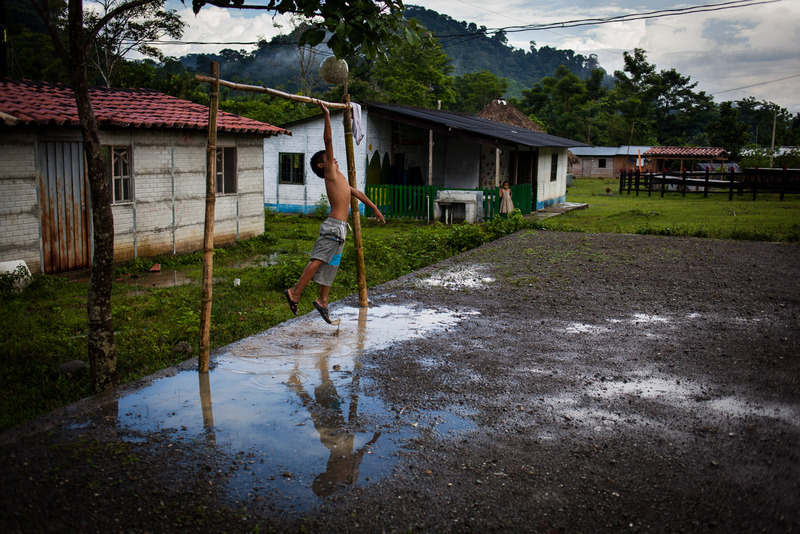 In the center of San Josecito, kids are playing football. Leisures are scarce in the community. Community leaders are threatened on a daily basis, via Emails, Text messages, or phone. Every single travel to the closest city is a big risk for them and worries their families. 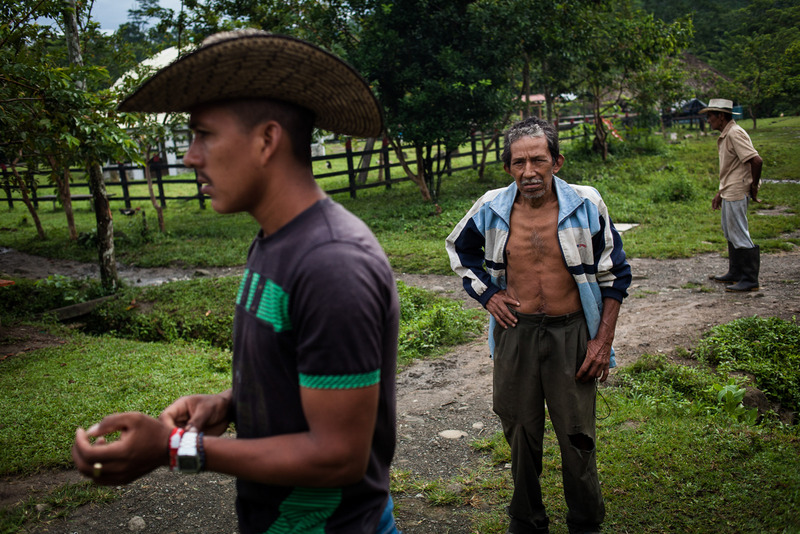 During the food blockage that faced the community, all the « chivas » (trucks) drivers, were murdered by the armed groups to isolate the community. These trucks are the only way the members of the community can reach the closest town. 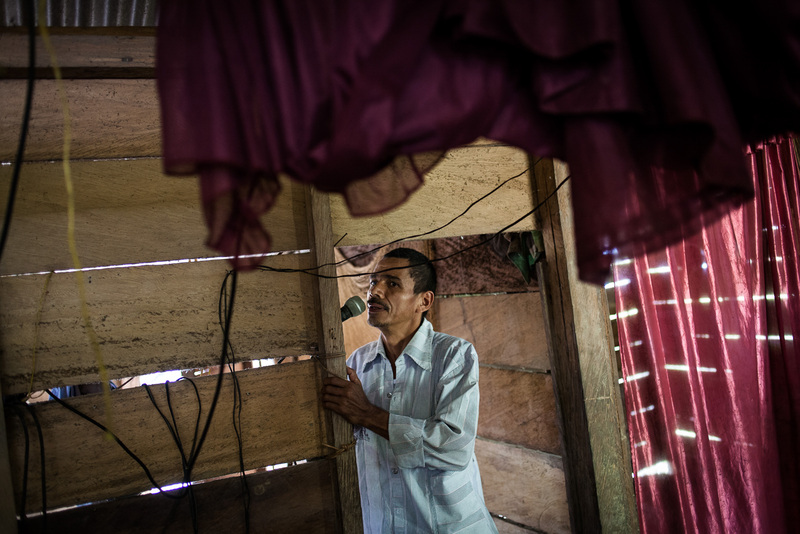 The oldest woman of the community is the mother of leader Jesus Emilio. Their familiy of 5 live all together in this room. 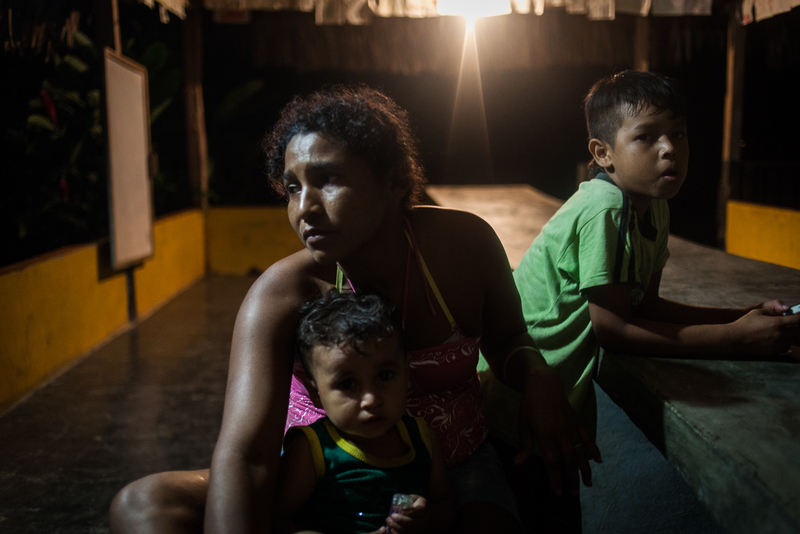 Loulou, leader Jesus Emilio’s wife lost one of her young child in an attack lead by the army in the jungle. She since joined the community. Here in the room she shares with her family. 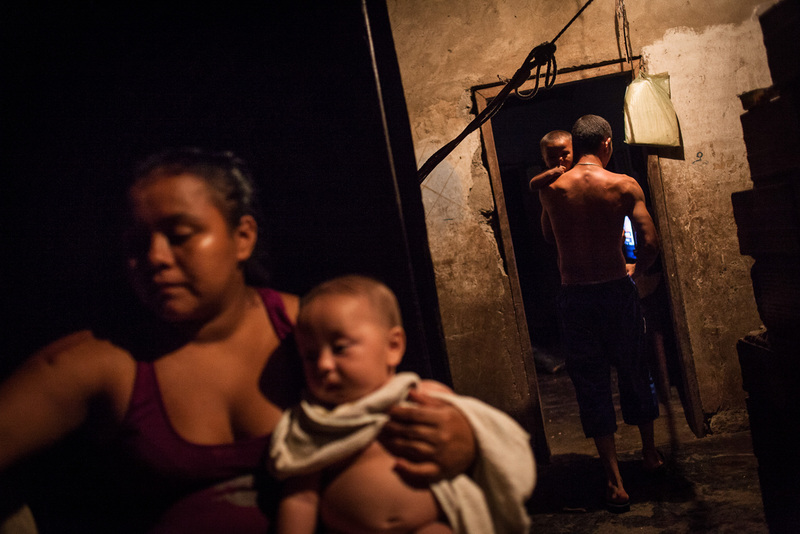 Maria Brigida had her young daughter killed by the army. Since then, she draws the history of the community and sells her paintings around the world to call the attention on their situation. Brigida is one of the founders of the community. She doesn’t know how to write or read. So she draws the memories of the community on her paintings. 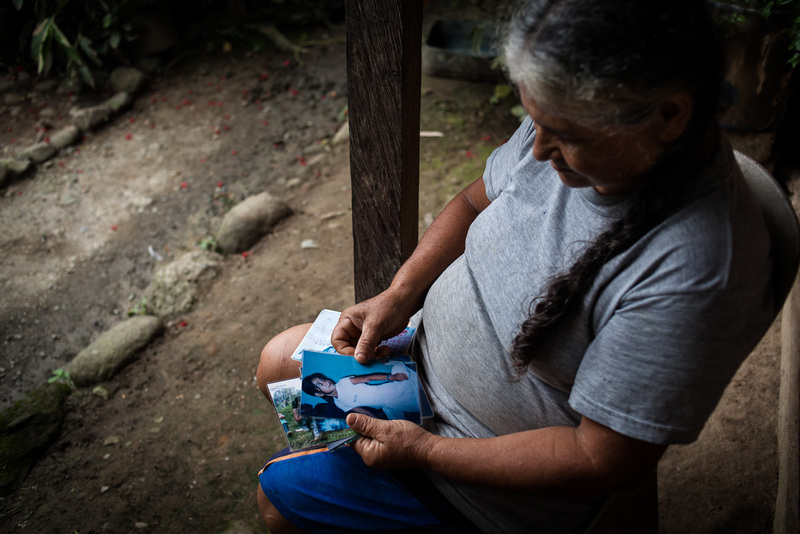 Maria Brigida’s daughter (on the picture she holds in her hands) was murdered when the army threw a grenade in a small house wher she was having a party with friends. 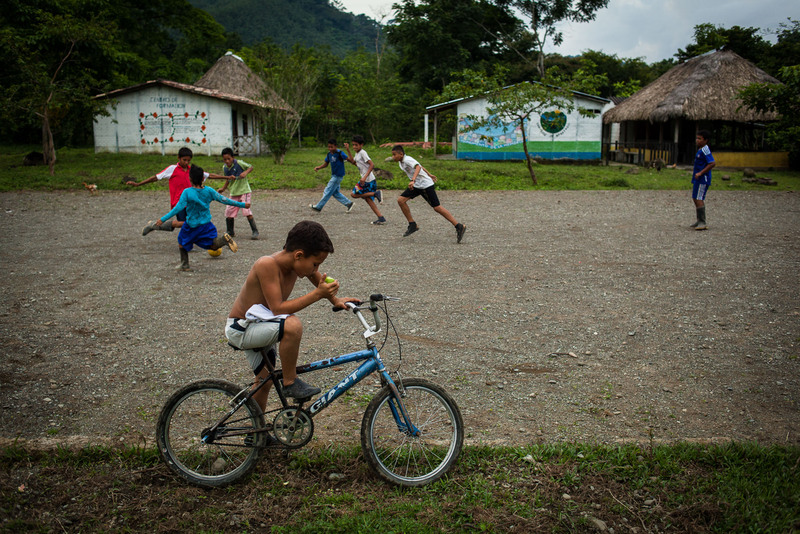 Surrounded by lush forest, the community lives away from civilization. 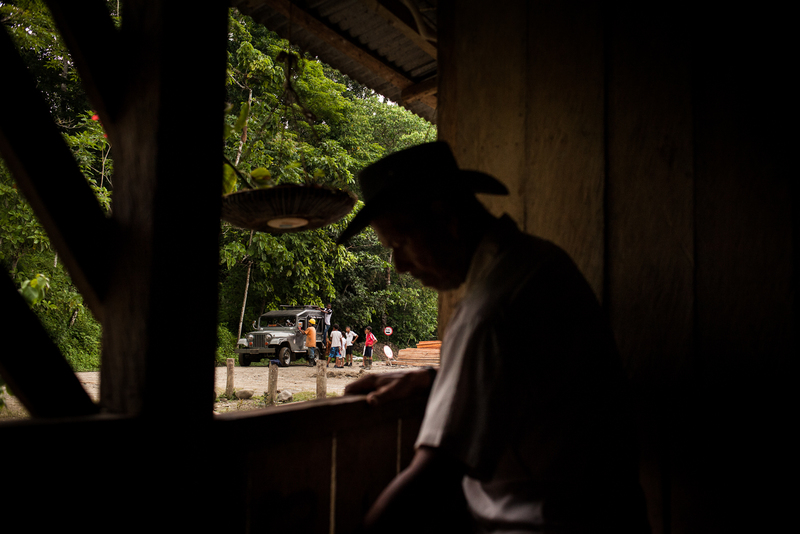 At any time, armed groups can come out of the jungle. 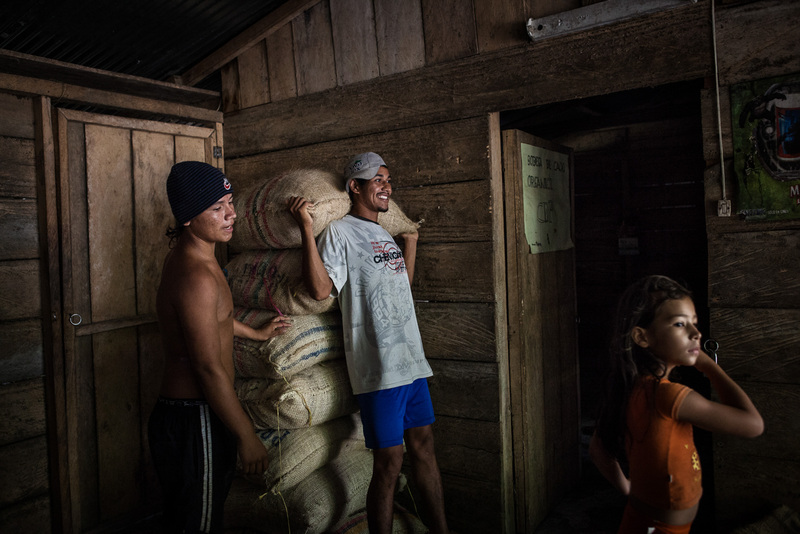 After suffering a food blockade, the community has learned self-sufficiency. 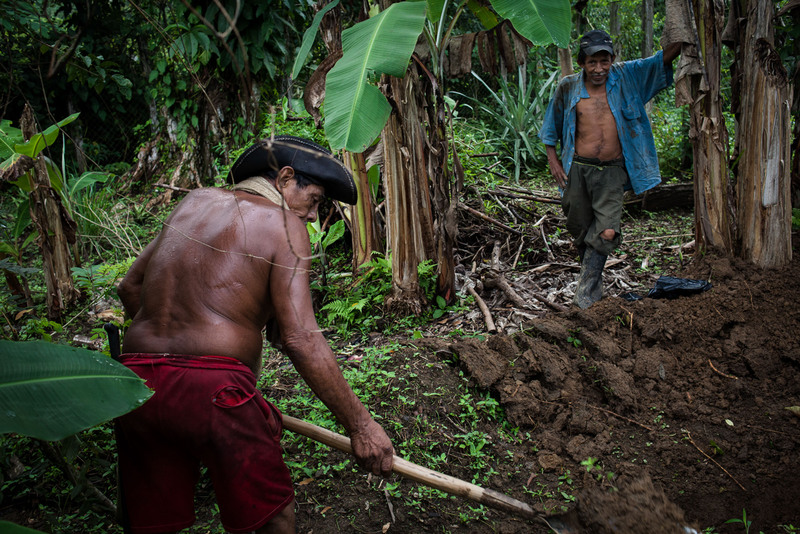 They cultivate their yuca (cassava), beans, sugar cane, rice and fruit. 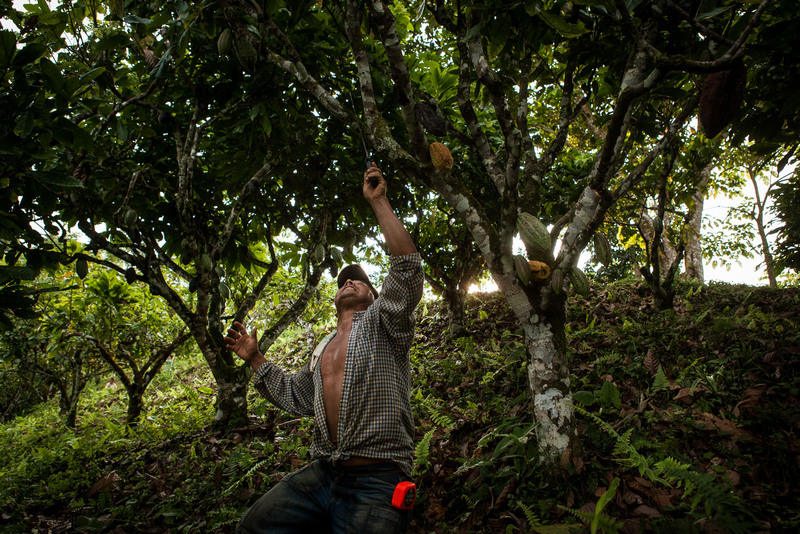 It also grows fair trade cacao which will be sold in Colombia and abroad. Once a week, members spend a day working together in the service of the community. 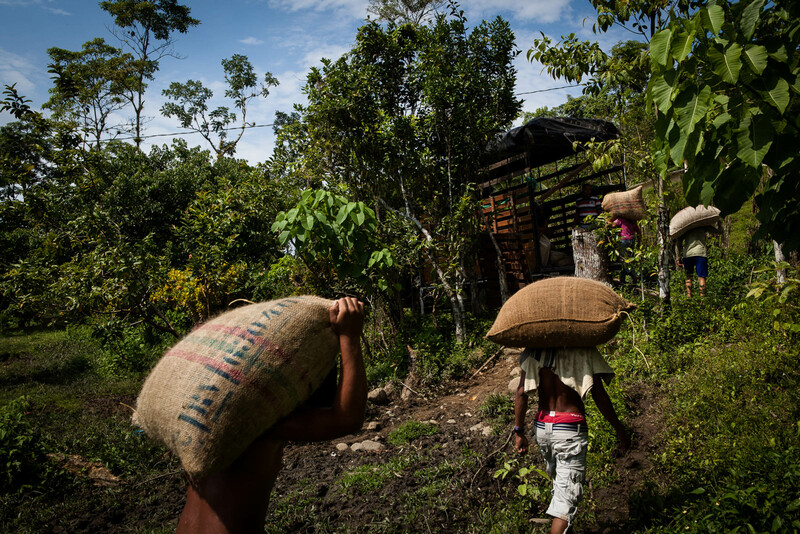 It is mainly to grow food or cocoa, source of income for the community. Traumatized by seeing his family massacred, the child has lived with his aunt and suffers from behavioral disorders. Day of community work in the village. 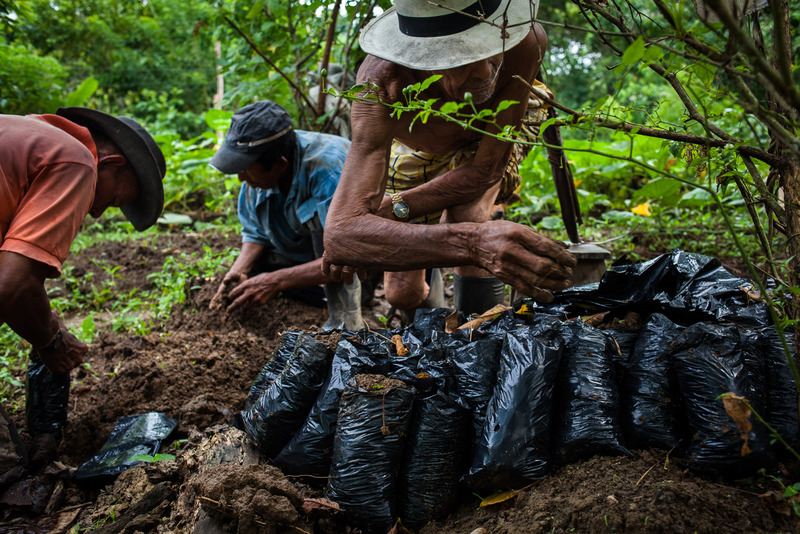 Members prepare bags of fair trade cocoa they export to Europe and sell in Colombia. Liliana has lost her husband in clashes with armed actors. Without resources, she manages the community cafeteria. Today is the birthday of her daughter. Liliana has lost her husband in clashes with armed actors. Without resources, she manages the community cafeteria. Horses and mules are the preferred means of transport for farmers in the community to go on their land or in neighboring villages. 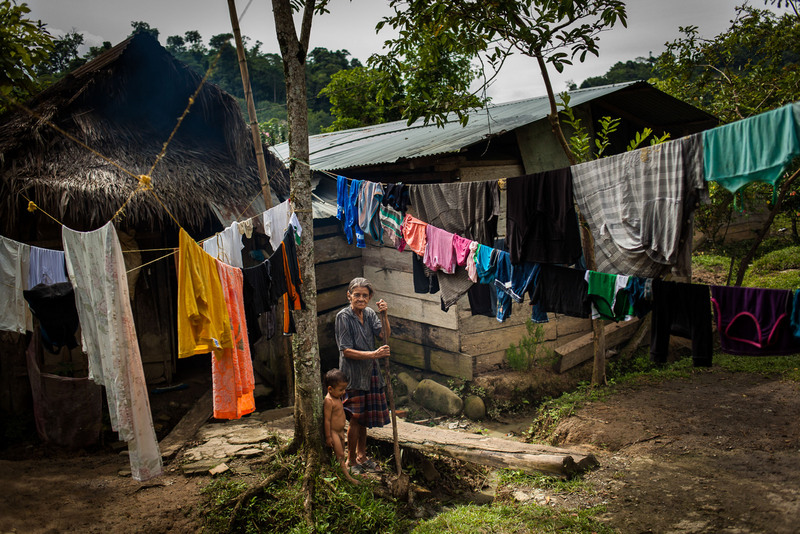 La Union is a hamlet belonging to the community, located 2 hours from walking in the forest of San Josecito. Its climate makes it an ideal place for agriculture and livestock. The responsible for agriculture is harvesting the cocoa. 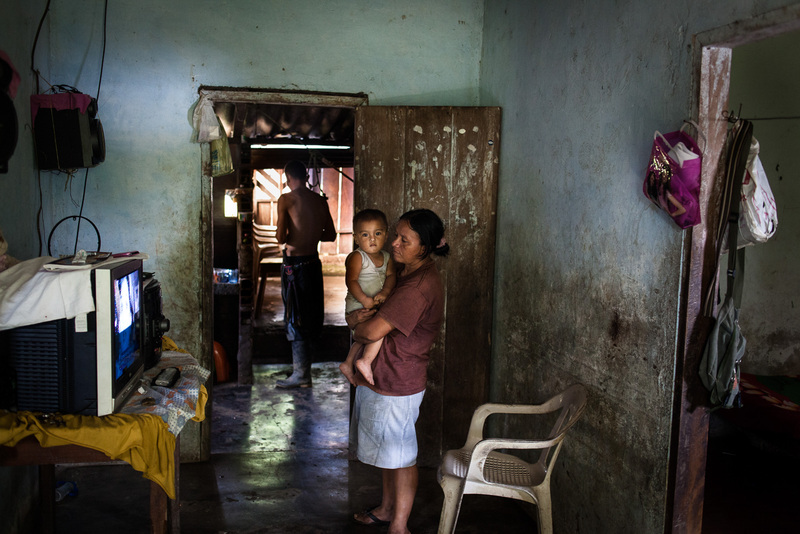 Berta, a founder of the commuanuté in the hamlet of La Union, with one of her little son. 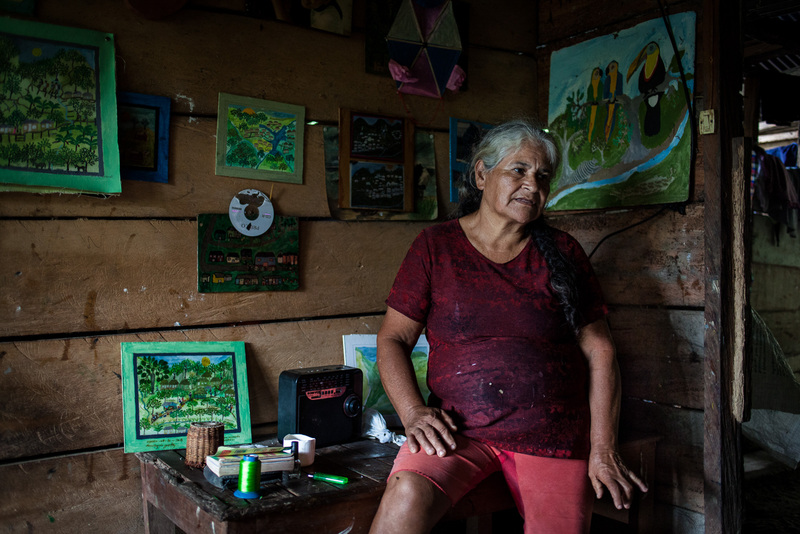 Berta is the only woman to be part of the community council. 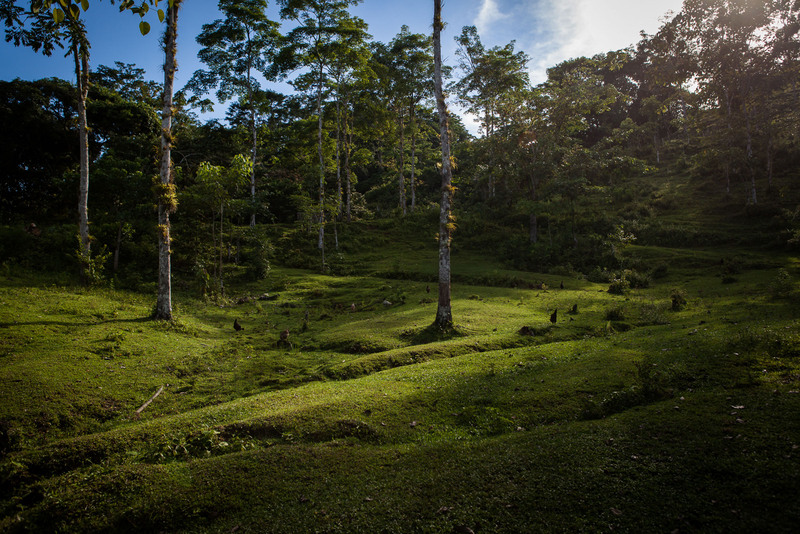 At La Union hamlet in altitude, the climate is conducive to breeding. The cows live in semi-liberty in the village. 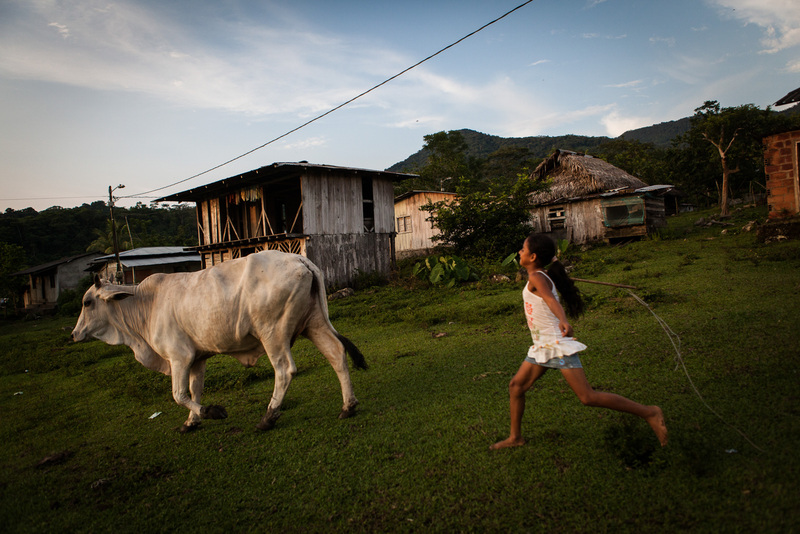 Before the peace community existed, cattle were regularly stolen by armed actors. 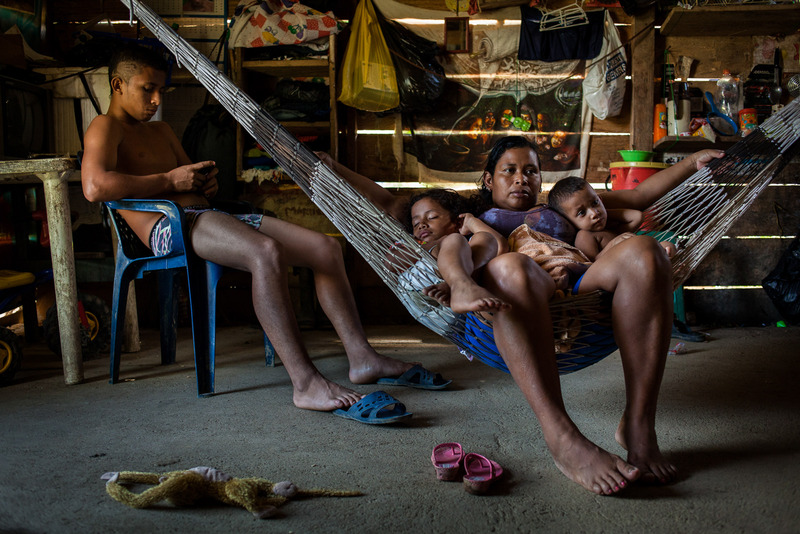 Berta’s daughter and her husband with their children in the family home. 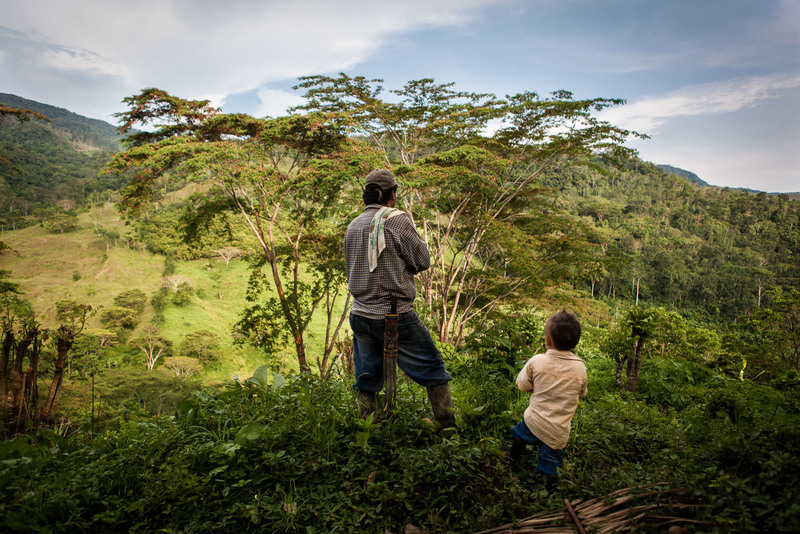 The head of the agricultural center, with his son, watching the forest around. 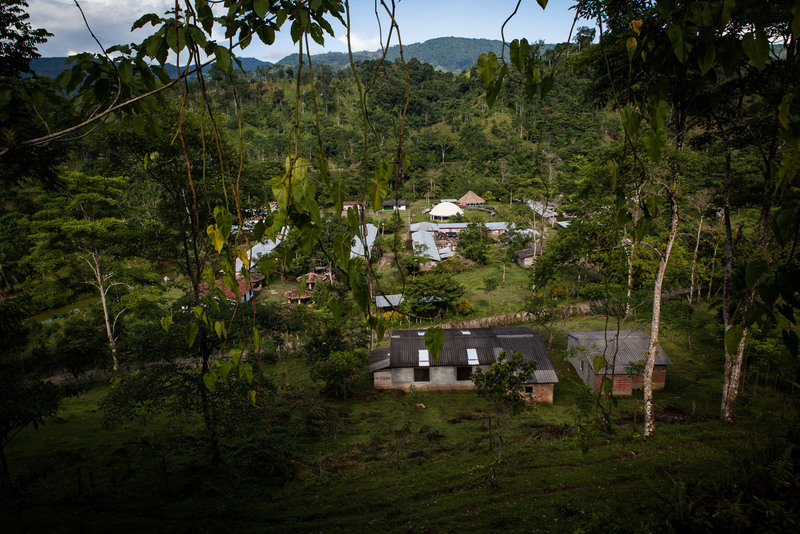 The Union is a hamlet belonging to the community, located 2 hours from walking in the forest of San Josecito. Its climate makes it an ideal place for agriculture and livestock.